With the TMS0952 Texas Instruments introduced in the year 1975 the first "real" single-chip calculator design. Read more about the associated TMS1000 family here. 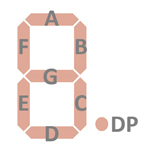 In opposite to the TMS0102 with the discrete segment- and digit-drivers or the TMS0803 with the external digit-drivers this design controlled the seven-segment display directly. The chip containes 8192-bit read-only program memory, a 256-bit random-access memory and a decimal arithmetic logic unit as well as control, timing, and output decoders plus drivers for the display. This gives an overall complexity of roughly 8000 transistors. The TMS0972 was introduced mid of the year 1976 and removes all passive components like resistors or capacitors needed with the TMS0952. Please notice the two different pinouts of the standard DIP-28 housing and the shrinked SDIP-28 housing (TMS0972 ASP). Please find a picture with all three calculator chips here. A typical calculator built around the TMS0972 family performs the four basic functions +,-,*,: and adds the %-function and a four-key memory. 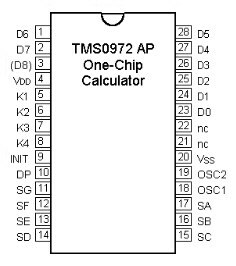 The TMS0972 AP uses a standard DIP-28 package. 7 I Keymatrix input 3 22 n.c.
8 I Keymatrix input 4 21 n.c. The keyboards of all calculators based on the TMS0972 family consist of a x/y-matrix connected to six segment-driver outputs and the keymatrix inputs K1 to K4. The Power on reset is usually not connected to a key. Calculators based on the TMS0972 make use of a 8-digit LED-display with common cathode architecture. The TI-1250 uses the LED-stick 233 without the leading digit populated.